It’s another dreary day here, a full day of rain predicted, the world outside my window hovering in a spectrum of grey. Inside, I continue to seek out color, hunting down bits of brightness, especially golds and yellows that remind me of sunshine. 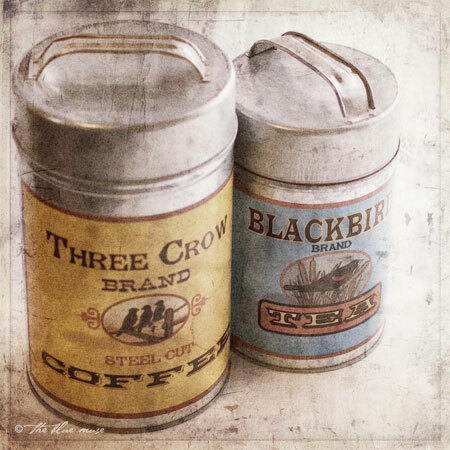 These canisters actually live in my studio, as storage for pens and office supplies, I bought them because of the birds on the labels. Actually, as I look around my house, I find that I have birds everywhere. Apparently, I have a thing for birds. Crows are one of my favorites, and though I know that’s a bit weird, I really like them. I have yet to see any real red-winged blackbirds this year, which will be another sign that Spring has arrived, but I did see a group of robins last week that left me smiling for the rest of the day. In May, the hummingbirds will arrive, I keep a feeder for them on my studio window so I can watch them throughout the day. Around that same time, the tree swallows will show up, chittering and chattering away, the sound of pure joy. For many years they nested in the birdhouses in my garden, but for the past two, the sparrows have kicked them out. I’m not quite sure how to solve this problem, but I wish I knew a way, I really miss their little chirps. Baby birds are the funniest thing, all mouth and hunger and need, and their parents work so hard to keep them safe and fed and ready to fly. I have rescued baby robins that have fallen from their nests, collected blue bird eggs that never hatched, cried when some predator managed to reach in and throw tiny, unhatched eggs to the ground. I have watched a mother swallow cajole her babies into flying, watched as one of those babies peeked his head out to stare at the ground for a very long time, and then looked up at his mother as if to say, “but mom, it’s a long way down!” He did finally fly that day, and then they were gone for another year. And now, just by writing this, I have managed to put a silly little grin on my face. On this day that feels so far from Spring, I have reminded myself that it will come, there will be sun and flowers and green and warm breezes, and there will be happy little birds to feed and watch and make me smile. I’m a real birdwatcher. I love your hopeful posts about spring. You’re toe tweet. we share the same enjoyment and sorrow. I’ll never forget the time we had some babies in a bird box that was located at the far end of our back yard. Each day the squeaks from the little guys would get louder and louder. I’d make sure to keep my distance so the parents wouldn’t be frightened off and they could feed their young ones. Then we were gone one weekend and when we got back there were no more squeaks. One day turned into two then three and the parents were nowhere to be found. Hubby finally opened the box to find them all dead. It was the saddest thing. My heart just sunk to my toes. I love birds too! Nothing heralds the coming of spring as much as the return of the songbirds and your post so beautifully reminded me of that. Crows are one of my favourite birds too! And woodpeckers, goldfinches, nuthatches, and… Thank you for bringing to my heart the wonder of birds! Witnessing mother nature up close and personal is one of the best feelings. I never knew I had a thing for crows and ravens until they started appearing in my artwork! I love birds, too, and red winged blackbirds and robins are probably my favorites, although nuthatches make me smile and I think any kind of wood pecker is a thrilling site. I’m nit so picky, though – I love grackles, too. as you may know I adore birds;0 I hope the dreary goes away very soon! !